2017 GoodLife Fitness City Chase - Ottawa is not accepting donations at this time. Please contact the event organizer if you have any questions. How can Chasers make a difference? When you fundraise for your Chase to GoodLife Kids Foundation, you help remove barriers that prevent kids with autism from being able to play sports. 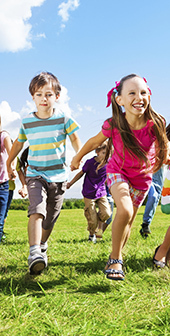 You can make it possible for these kids to access specialized programs that provide them with modified equipment and the one-on-one support they need to get active. Chasers who choose to fundraise don't only get perks on Chase day, but they also make a difference in a life of a child living with Autism. 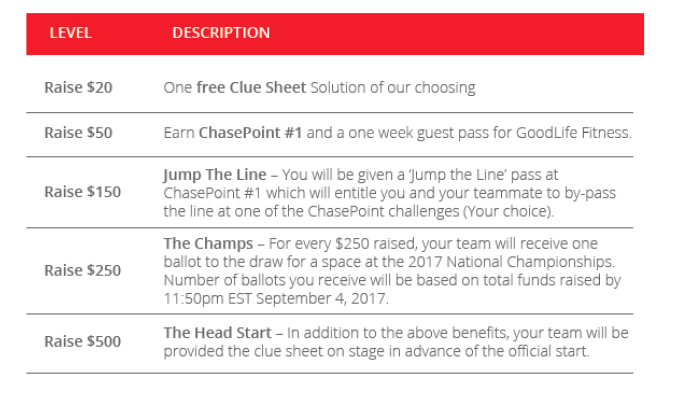 Become a #FUNdraisingChaser and get an edge in The Chase! By indicating your acceptance, you understand, agree, warrant and covenant as follows: In consideration of your accepting my entry, I, intending to be legally bound, do hereby, for myself, my heirs, executors, and administrators, forever waive, release and give up any and all claims, demands, liability, damages, costs and expenses of any kind whatsoever, including personal injuries to me or wrongful death against, 2017 GoodLife Fitness City Chase - Ottawa, Ottawa&comma; ON&comma; CA, Recreation and Parks Department, sponsors, volunteers, contractors, subcontractors and their employees, representatives, agents and heirs, which may arise from my participation in the 2017 GoodLife Fitness City Chase - Ottawa on July 08, 2017 or while traveling to or from the event, even if caused in whole or in part by the negligence or other fault of the parties or person or persons I am hereby releasing, by the dangerous or defective condition of any property or equipment owned, maintained or controlled by them and/or because of their liability without fault. I FULLY UNDERSTAND I AM FOREVER GIVING UP IN ADVANCE ANY RIGHT TO SUE OR MAKE ANY CLAIM AGAINST THE PARTIES I AM RELEASING IF I SUFFER SUCH INJURIES AND DAMAGES EVEN THOUGH I DO NOT KNOW WHAT OR HOW EXTENSIVE THOSE INJURIES AND DAMAGES MIGHT BE AND AM VOLUNTARILY ASSUMING THE RISK OF SUCH INJURIES AND DAMAGES. I attest that I am physically fit and sufficiently trained for this strenuous competition. I will assume my own medical and emergency expenses in the event of an accident or other incapacity or injury resulting from or occurring in my participation. In consideration of this being an amateur event, I release the rights of any and all photographic material, motion picture, video tape, recordings and/or computer information organizers may wish to release for this event without obligation to me.